A close up photo of some ants eating away at some unknown insect that is smashed and lying dead on the floor of my hotel room. There are many insects in my room, little flea types, ants, big one, little one and of course the world famous cockroach. 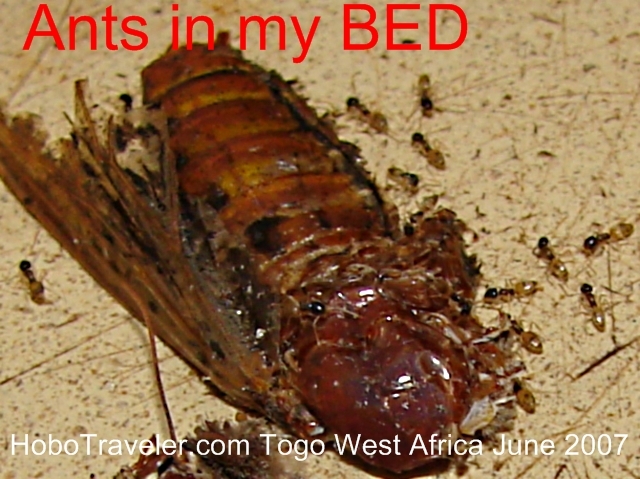 I am starting to consider the cockroach as just an ugly friend, because I hear they eat bedbugs. I thought I was doing well; I paid 800 CFA about 1.50 US to buy the insecticide to spray my room for bugs. I thought I was being clever, then what happens, I gave my number one enemy a free lunch, and I paid. I sprayed the room, as I hope I understand, I do not know, I was not watching this bug die. Ok, I sprayed the room, really good, I used the whole can, I think afterwards this bug fell onto the floor, I suspect I step on it and spattered it on the floor when I was making my bed. The guts and glory spread out on the floor, then along came the ants to feed. Just when you think you got them, they got you, I despise ants, and I have totally stopped eating any sugar candy in room. If I have a wrapper from a candy, I would throw it out of my room. I will not put it in the waste or rubbish bin in my room; it is thrown outside the room. I do not feed ants, I hate these mini cannot be seen so small ants, the crawl on my body, in my hair, I can feel them, I know they are there. Ok, no more free meals, I am going to sweep my room. Note, there is a big hollow space under my concrete bed, I do not like to look, I often find used Condoms, and I am not brave. I am going to have this area swept and cleaned of ant food.